How A Violinist Saved 1,000 Jews In World War II : Deceptive Cadence The story of how legendary violinist Bronisław Huberman used his prestige and fame toward a heroic end inspired a documentary film. See the trailer and learn more about the founding of what became the Israel Philharmonic Orchestra. 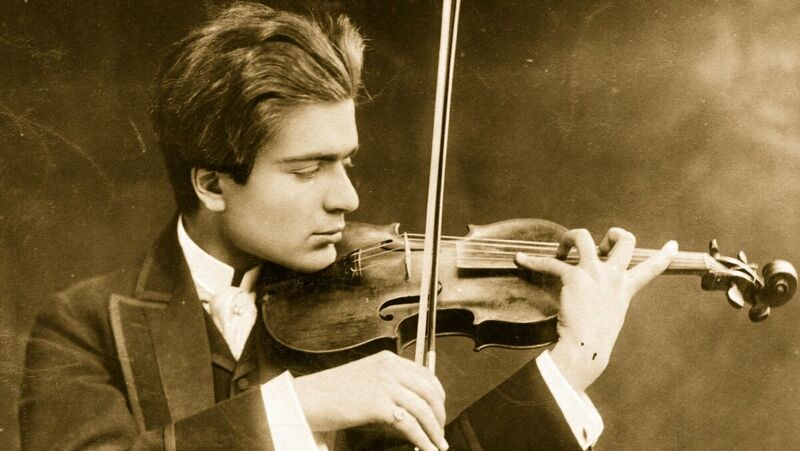 Violinist Bronislaw Huberman in a 1900 photo, taken when he was 18 years old. Among the most extraordinary of that number, however, has got to be the Polish violinist Bronisław Huberman. As a child, he toured Europe as a prodigy, impressing even skeptics like Brahms, for whom at age 14 he played Brahms' violin concerto, a piece written for Huberman's teacher, the great Joseph Joachim. But what made Huberman far more visionary — and what had a far larger impact than his music making — was the political foresight and bravery he displayed during the Nazis' rise to power. As the situation for Jews began to deteriorate steadily in Europe, Huberman used his reputation and prestige toward a bigger goal than his own fame and fortune. He began recruiting the best of the best Jewish orchestral players to regroup in Palestine as a new ensemble, the Palestine Symphony Orchestra, later renamed the Israel Philharmonic Orchestra. For this effort, he enlisted the aid of such celebrities as Albert Einstein and Arturo Toscanini, the orchestra's conductor at their first concert on Dec. 26, 1936. Huberman's story is told in an absorbing documentary made by Josh Aronson called Orchestra of Exiles and newly available on DVD. As musician after musician and their descendants testify in Aronson's film, if it hadn't been for Huberman, dozens of musicians and their families — nearly 1000 people in all — would nearly certainly have died if they had stayed in countries including Germany, Austria, Poland and Hungary. As Aronson makes clear, Huberman had the prescience to realize that far more than a new job was at stake for these artists. And along with literally saving lives, Huberman found a way to preserve and perpetuate an enormous legacy of European Jewish musical tradition. Huberman's story is a terrific if wrenching narrative that deserves to be far better known. Aronson brings a particular ear to his work; his Oscar-nominated documentary from 2000, Sound and Fury, was a compassionate profile of an extended family wrestling with the decision of whether or not to give their deaf children cochlear implants. What I didn't realize when I saw that earlier film just how fundamental sound and music are to Aronson. In his non-filmmaking life, he is a concert pianist and the husband of violinist Maria Bachmann, with whom he runs the Telluride Musicfest. When he turns to this historical story, however, Aronson is a more uneven director; his reliance on corny re-enactment segments is particularly unfortunate. Even so, it's a story begging for wider recognition, which hopefully it will get this month, with the DVD out and a national airing on PBS scheduled for Sunday, April 14th.